This commercial cover was sent from Pointe à Pitre. 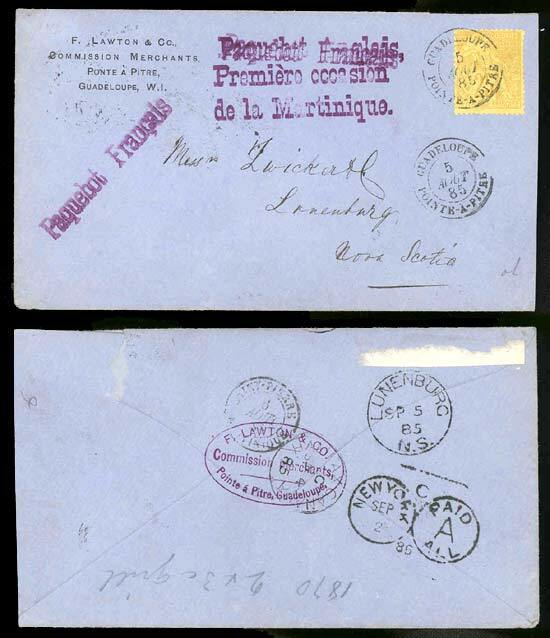 "Paquebot Français | Première Occasion | de la Martinique"
as noted by the purple stamp. The request was for service via French packet on the first sailing to Martinique. The seller suggested that this was the earliest use of the first sailing request he had seen. to the flap that announced his business as a commission merchant. on straw colored paper perforated Commerce stamp (Scott 53). There are two Pointe à Pitre CDS. The destination was Lunenburg, Nova Scotia. Lunenburg is on Mahone Bay on the Atlantic Coast about 90 km southwest of Halifax. The cover got speedy service to Saint Pierre, Martinique, arriving there on August 6.
coast of Martinique from Fort-de-France, the principal city of Martinique. Apparently this is where the mail from Guadeloupe was serviced. a binocular PAID | ALL | A cancel was applied. Next stop was Halifax on September 4. Note that the CDS (inverted near the point of the flap) has Canada and not Nova Scotia. The cover then went on to Lunenburg where it arrived on September 5. Someone used the cover for a note at one time: "1870 2 v 3c grill."